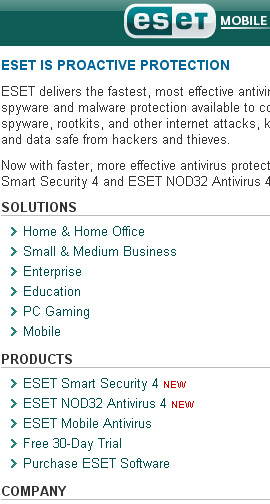 ESET Mobile is a mobile device user friendly version of the full ESET website. It focuses mainly on product and contact information and is built to be easily viewed on a small screen. I worked with the company's graphic designer to develop the HTML and CSS for this version of the site. I set up a redirect so that the ESET website can detect if someone is using a mobile device and will automatically redirect them to the mobile site. I set up a URL so if the visitor wants to see the regular ESET website they can click on the link for it and it will display on their phone and override the redirect.